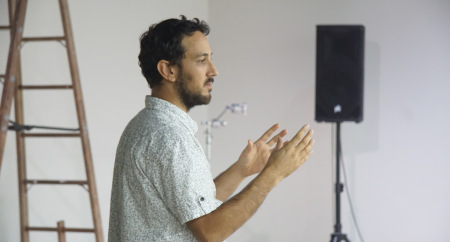 George Rahi is a composer, sound artist and instrument maker exploring new hybrids between the acoustic, electronic, mechanical and sculptural. He commonly works across a diverse array of interests including electroacoustic music, robotics and large-scale instruments such as the pipe organ and the Indonesian Gamelan. He has produced work for the Western Front, Vancouver New Music, Miscellaneous Productions, VIVO Media Arts Centre and Vancouver Co-op Radio’s Media Arts Committee. He is a founding member of the percussion ensemble Gamelan Bike Bike and art collective Publik Secrets, currently in residence at the Hadden Park Field House, unceded Musqueam, Squamish and Tsleil-Waututh territories, Vancouver, British Columbia.